Allison Weiss has become a successful blogger, but the pressure of deadlines is getting stressful, especially when you add it to her daughter's tantrums, her father's Alzheimer's, and her crumbling marriage. She doesn't see a way out from under her crushing responsibilities, but she has found something that makes it much more bearable: Vicodin. And Percocet. And then Oxycontin. When she runs out of prescription pills she needs to find another source and the money to pay for them, and now that too is added to her stressors. But she's not a drug addict...or is she? Traditionally, I've read every Jennifer Weiner novel as soon as it's published, but then when I read The Next Best Thing, I was so disappointed that I vowed not to run out and immediately read her next book. When All Fall Down was released last year, I heard from a friend that it was much better than her previous novel and thankfully, she was right. I found Allison to be a realistic character with problems many women can identify with. Her daughter was extremely sensitive and although she was lovely in many ways, she was a lot of work. Her relationship with her parents was not helped by her father's rapid decline, and Allison had to assume most of the responsibility because of her mother's own set of problems. She became convinced that her husband was having an affair and didn't know how to handle it, but knew she didn't want to lose him. So when she began refilling prescriptions for pills she no long technically needed, it was easy to see how the situation could escalate. She was careful in her own way, but still began taking pills more and more often. There were times that I thought "Come on, Allison, surely you can see that you have a problem?" but it wasn't bad writing, it's the reality of addiction. She kept justifying her behavior and making excuses and I wanted to slap her sometimes, but I also felt sympathetic. There was a lot going on in her life and while taking pills didn't actually make any of those things better, I could see how it could make her problems a little easier to deal with. But just temporarily, of course. There was a point at which the scales tipped drastically in the direction of harm. You know, I hope I never have to go to rehab, because I would not be able to stand the patronizing attitudes of the counselors who Allison had to deal with, never mind how God-centric the program is. Although I know that Allison did have a problem and needed help, this rehab did not sound especially helpful or fair. It did, however, sound realistic. She described the drab furnishings and the bland food, and the under-qualified staff who were being pulled in too many directions at once. (Don't even get me started on how awful the library was.) That has all got to make it harder to stay and get better. Weiner seems to be in top form again with this tale of suburban middle-class addiction. I kept thinking about Ann Leary's The Good House - there are so few books about addiction, especially in professional women, and I suspect it's more common than many of us think. 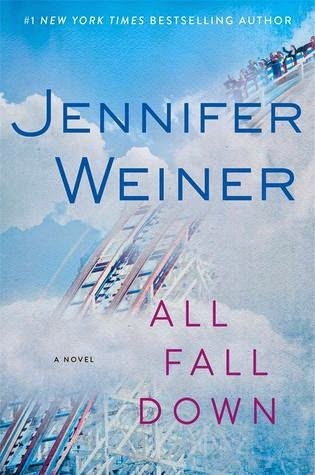 It was also nice to again read Weiner's familiar, funny voice, and now that I've heard her speak a few times, I do sort of hear her voice in my head when I'm reading her books. All in all, I really enjoyed this story!